What the heck is a pig ear? Errr, umm, back off!! At the time, pig ears seemed a logical special treat. I know. There are various reasons to be grossed out. But the pig ears called out to us, and we bought two, one for each dog. When we got home, Lexie and Charlie were more interested in a trio of stuffed chipmunks we picked up at Petco. They each grabbed one, and ran off, squeaking away, occasionally tossing one up in the air and catching it. 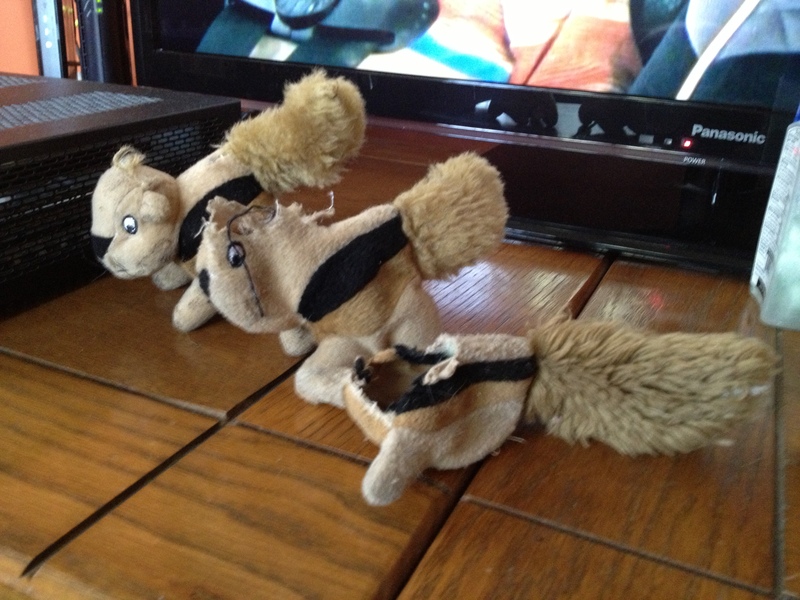 Trio of chipmunks, in varying states of dismemberment. Once chipmunk mania subsided, I pulled out the pig ears and gave one to the dogs. Even though it had been years, Lex knew what was at stake. She bit into the ear, ran to the rug by the front door and coveted her booty. Our puppy Charlie had other plans. At first, he eagerly took the ear, then as he ran away, he acted like it was super heavy and let it drop from his mouth. As the ear hit the floor, Charlie jumped and scurried in the other direction with his tail buried deep between his hind legs. Matt picked up the ear, and tried to give it back to Charlie. He recoiled. Charlie lowered his head, and … was that a growl? At one point Matt got Charlie to take the ear. Charlie took a few steps away, then returned to Matt, nudging the ear back in his hand. “I do believe this belongs to you,” Charlie said. Lex soon lost interest. Her mouth motor skills just aren’t that sharp anymore, and chewing a pig ear appeared too exhausting for this 14-year-old pup. We put her ear up on the counter, but left the other one out. After snapping a few blurry pictures of Charlie running away from the ear, Matt and I gave up. We left the ear on the kitchen floor and moved to the front room for some TV. A few minutes later, once we realized Charlie didn’t follow us to the couch, I went looking for him. 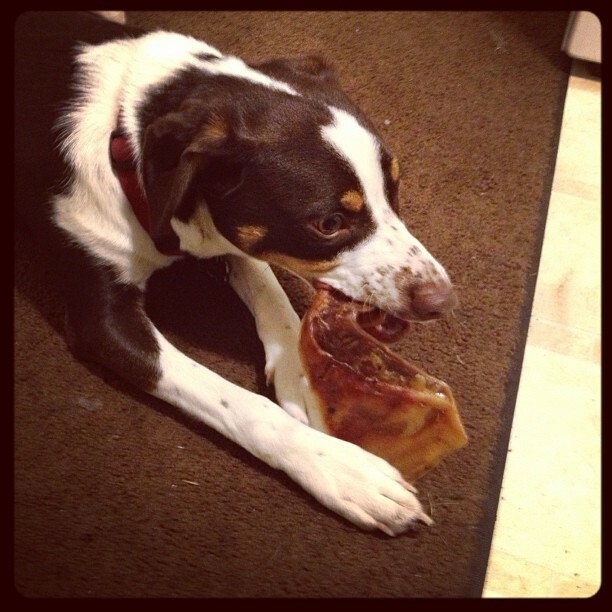 I found Charlie spread out on the kitchen floor, his front paws and mouth wrapped around the pig ear. While he was engrossed with his tasty treat, we decided to slip out to the store. When we came back, most of the ear was gone, except for small ear chips that we found, evidence that Charlie finished off the snack on the couch. I guess I’ll never know what was going through Charlie’s mind. I’m sure that being presented with a dried out pig’s ear is enough to scare anyone, let alone a little puppy. From now on, I think we’ll stick to dog biscuits. I’ve never seen Charlie run from a Milkbone. This entry was posted in Woof! and tagged adopt, animal rescue, dog, dog treat, pets, pig ear, puppy by ourfureverfamily. Bookmark the permalink. Charlie was very brave, overcoming his fear of the ear. I never even tried a pig ear. I am not a big chewer, but boy do I love sniffing them in Petco. I drag Mom back and forth and back and forth in the rawhide aisle and smell every bin over and over. When she tries to give me one, I have no idea what to do. Maybe someday I will be brave like Charlie and stop being afraid of the telephone poles. Hi Cupcake! Fear of the ear is a real fear, indeed. I’m so proud of Charlie for confronting this scary thing. And be brave! I know you can do it too!! Oh yum – that looks so good! I’ll have to reach for a toy now, but it’s not as good as a pigs ear. Charlie would send you Lexie’s if he could!! Doggy loves pigs feet, I bough them by accident and he destroyed it in minutes. Oooh, we may have to try those next!